I saw an article on the Oatmealicious cookie at Cups and Cakes Bakery earlier this week on SF Weekly and forced my boyfriend to get one for me since he was on jury duty near by. On Thursday, he picked me up from work with a big pink box full of cupcakes! (They were out of the Oatmealicous cookie.) Aw, thanks K! I’ve never seen cupcakes like these before. Most designer cupcakes are perfectly symmetrical, but not these. They had a real homemade look and came in little paper cups rather than the usual cupcake wrapper. Their signature is the little slit on the side of the cup, so you can easily tear the wrapper off. K bought 6 cupcakes and the kind owner gave us a mini red velvet for free. We ended up eating the cupcakes over the next 2 days, and the cakes were still moist – a real plus. Cupcakes are $2.75 each. Cloud 9 – I totally understand why they call it Cloud 9. This cupcake is made of a sticky and chewy angel food cake topped with a fluffy marshmallow frosting. The frosting is a little too sweet than what I’m used to, but supposedly it’s only 150 calories so it’s A-OK with me. Cherry Soda – This one was alright. Again, too sweet for my taste. I have no idea what kind of cake they use for this. I’m guessing a caramel? The frosting had a hint of cherry soda flavor. Vanilla & Chocolate – These are 2 separate cupcakes, but I’m just going to do a combined review. These 2 were the prettiest of the bunch. The vanilla is topped with a big swirl of vanilla frosting and a mini vanilla wafer cookie. The chocolate was topped with chocolate frosting and a chocolate chip. Both were really good. Moist cake, not too much frosting, not too sweet. 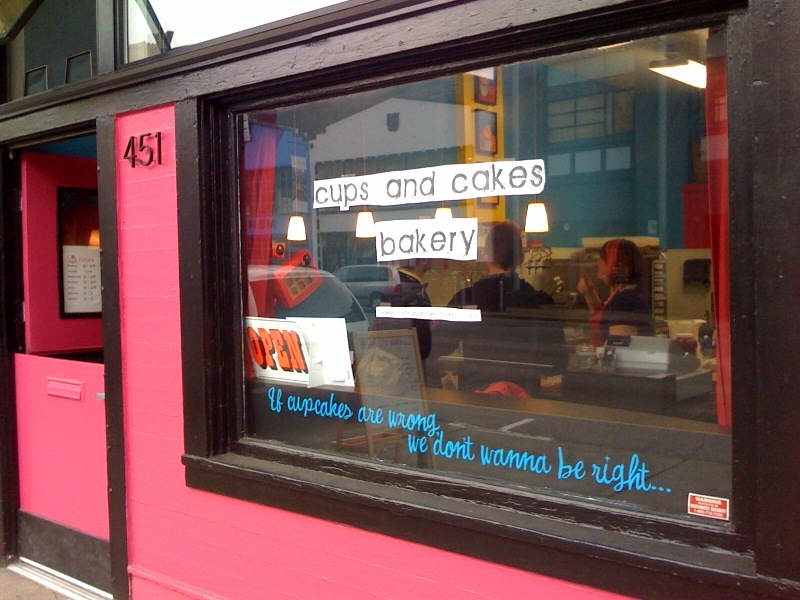 I’d like to come back to Cups and Cakes Bakery to try the Oatmealicious cookie. Two soft and chewy oatmeal cookies sandwiching cream cheese frosting and chocolate ganache. YUM. I’ve got to try one of those soon.